Creating fashion design with free templates and examples. Fashion design has never been easier. Fashion design is the art that involves the application of design and aesthetics to clothing and accessories. Fashion design is directly influenced by cultural and social latitudes over a given period of time. A person practicing this art is called a fashion designer. The first fashion designer was Charles Frederick Worth, in the 19th century. Fashion designers attempt to design clothes which are functional as well as aesthetically pleasing. Edraw fashion design provides you lots of templates for girl dress, man suite and children dress. With these ready-made templates, it is very easy for you to find out perfect color assortment and your dressing style. Learn some useful tips about How to Match Clothes for the Best Look. Are you full of amazing fashion ideas but unable to design them properly? Are you not professional at drawing? Don't worry. 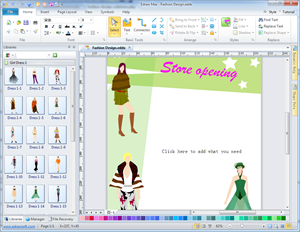 Try our fashion design software in Edraw which gives you a wide assortment of models, hats, clothes, tops, bottoms, and shoes in a variety of colors and styles. Just follow some easy steps to design clothing of all types for men, women, and children. Contains ten unique model with a variety of skin tones and hair colors, hundreds of cute clothing items to mix and match. Contains hundreds of man suits. Contains hundreds of child dress.